Kingsbridge railway station opened in December 1893. The stone built station served the town and the surrounding area and was the terminus station of the single track branch GWR line from Brent to the town of Kingsbridge. The 12 mile line know as the 'Primrose Line' wound through the wooded Avon valley, serving intermediate stations at Avonwick, Gara Bridge and Loddiswell. The station was also the railhead for the town of Salcombe. Work was started on construction of the extension of the line from Kingsbridge to Salcombe but work was soon abandoned. Popular for both local and leisure travel, the station saw a 25% increase in traffic during its last year of operation. Despite a great deal of local opposition, the station was closed for freight and passengers on 16 September 1963 as part of the Beeching cuts, and the station site is now covered by an industrial estate. Following the closure of the ‘Primrose Line’ the track was rapidly removed and the infrastructure buried. Many of the bridges and buildings built by GWR were extremely well built and some remain intact and in sound condition. The Plymouth Road Railway bridge is one such structure, which remained buried for over forty years. It was decided to excavate the upper arches of the bridge as part of a heritage restoration project. This coincided with the formation of Kingsbridge in Bloom community group and work was started on the bridge in June of that year. The work was initially funded by the Kingsbridge Information Centre. Architectural plans, excavation and materials were largely donated without charge. The excavation revealed a beautifully constructed and ornately designed bridge. The site’s ground works took approximately two months and around 200 tonnes of earth was removed. The soil was used to create the ‘Devon’ bank which over the ensuing years has been planted and kept tidy on a regular basis. Kingsbridge in Bloom took over the maintenance work on the site in 2008. The area was landscaped turfed and grass seeded to make it easier to keep tidy and give the site a more pleasing look. It is an important part of the South West in Bloom judging route and also enters the IYN assessment recently obtaining ‘outstanding’. Locally sourced railway memorabilia was added. Old railway lines and sleepers were uncovered at the site of the old railway station. Benches, milk churns, luggage trolley, teapot and signals were added to the platform area to create an authentic look. 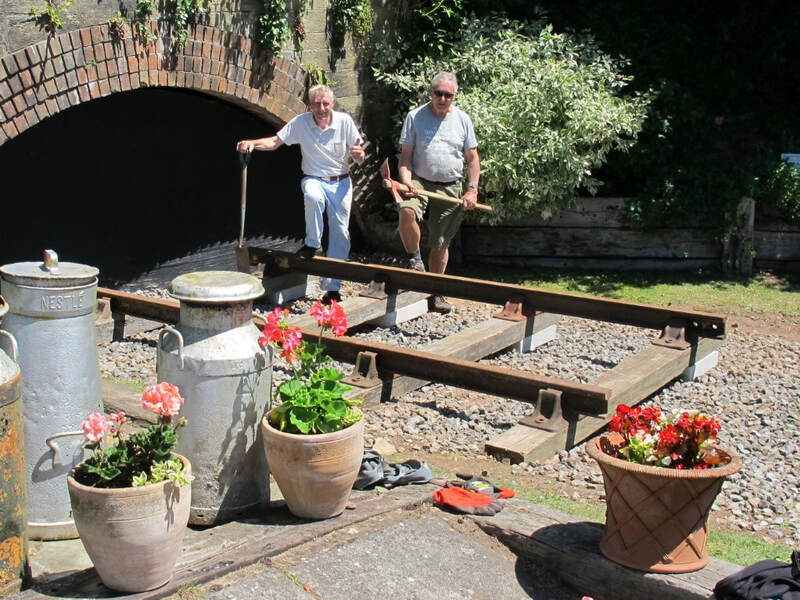 Two planters constructed by Kingsbridge College students have been planted with flowers and vegetables depicting the days when the Station Master and his staff grew their own produce. 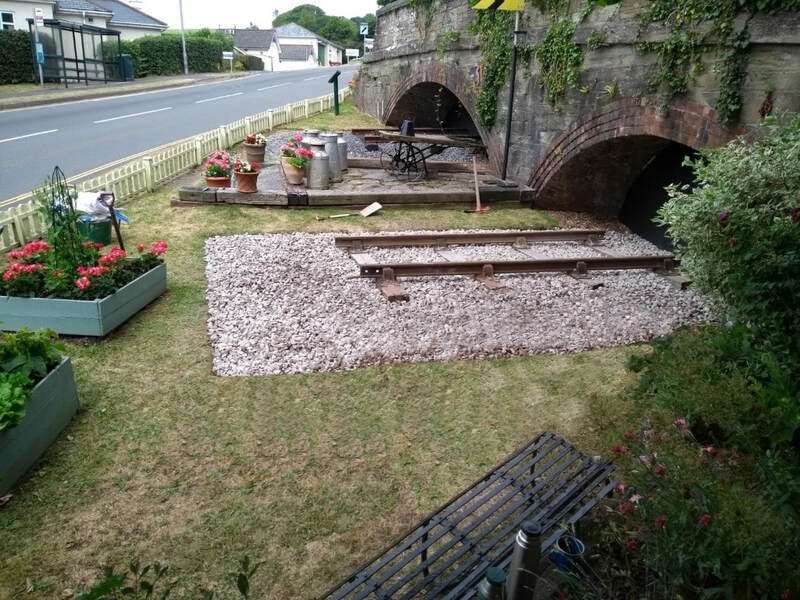 Over the years the site has been greatly enhanced with floral changes and artefacts befitting a railway bridge. 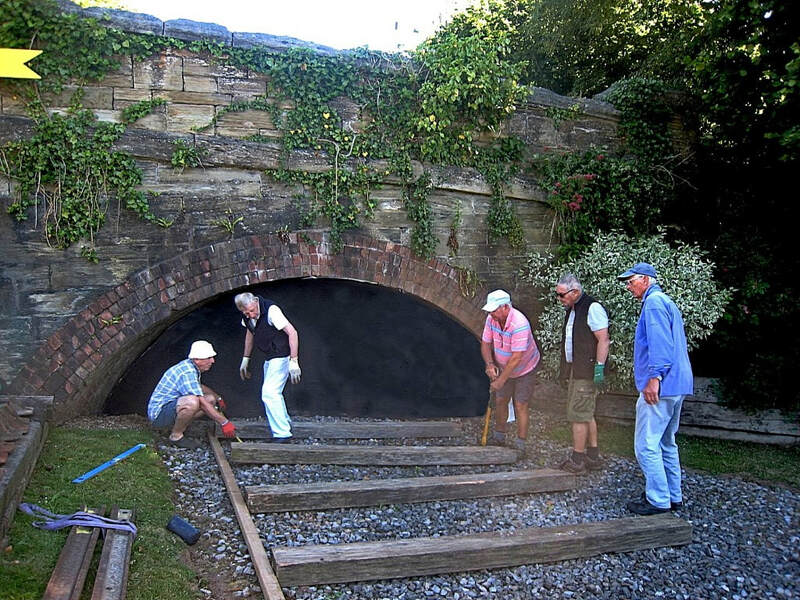 Additional rail, sleepers and gravel were added to the lower tunnel area to make it more authentic. These were sourced from the South Devon Railway Depot at Staverton station. 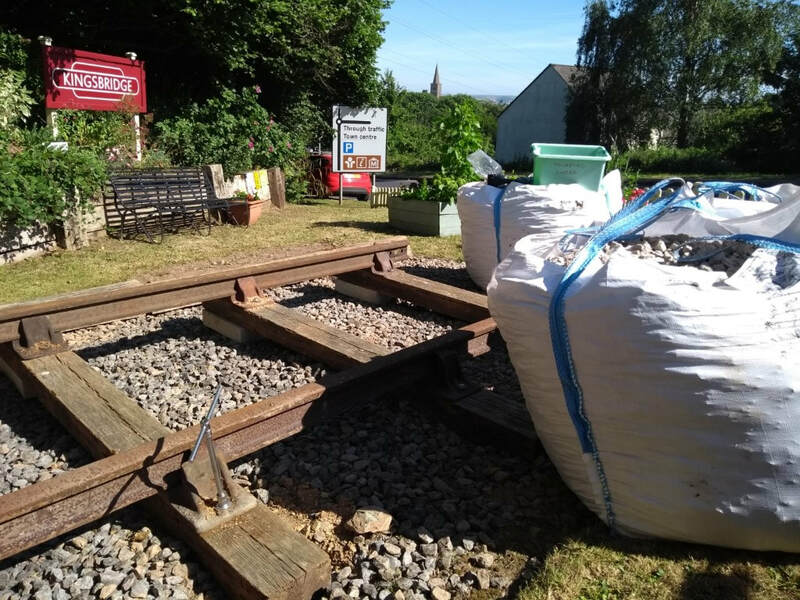 A local company provided transport and storage facilities and stone aggregate was obtained to build up the ground around the sleepers. The labour was provided by Kingsbridge in Bloom volunteers. Refurbishment of the site takes place on a regular basis. A new flower bed along a newly installed footpath has been created and the small bank adjacent to it has been landscaped to make it easier to keep tidy. Extra flower pots have been added to add to the overall floral display. to edit. A local business man recently made us aware of architecture the brick work on the Bridge. The decorative work is called Skew bridge work and is based on a design by Brunel. It is particularly interesting due the graduating brickwork going to flat then to graduating again. There are other examples in the area and are part of a You Tube video. The Railway Bridge is recognised as being iconic by residents of Kingsbridge and visitors alike. 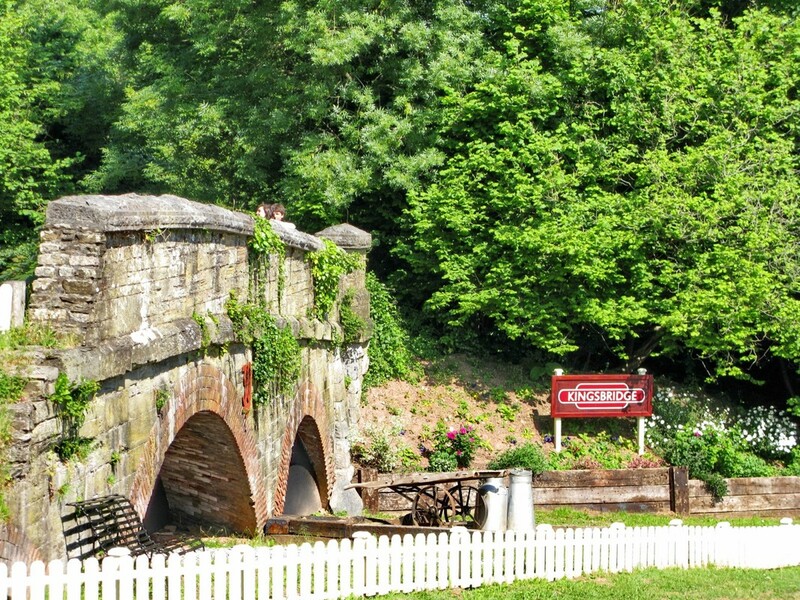 It is a reminder of an era that public transport was an essential way of travelling and whatever our thoughts are on why it was closed down we are left with a site to remind us of those days and it has become part of the heritage and history of Kingsbridge. ​Below is an old 1959 video mainly focusing on the engines but does feature the Kingsbridge branch line and Station from Brent.